Dolly Sen is a well known artist and activist working and exploring what it means to experience mental distress and the effects of being labelled with a psychiatric diagnosis. Her art is witty, humorous, but also cutting and corusacting subtly getting under the skin of everyday psychiatric assumptions that leaves one feeling both wiser and nourished yet still in good humour. We are all the better for her art. 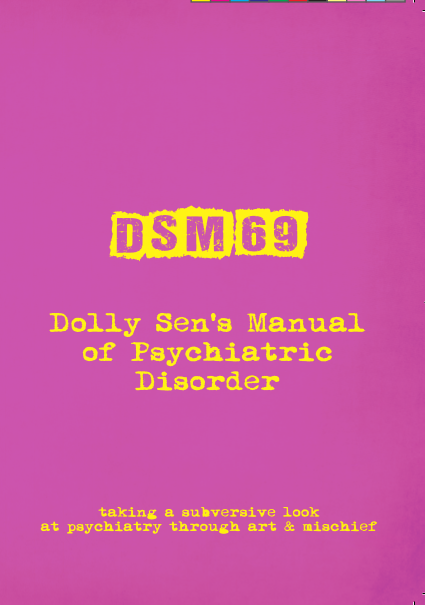 DSM69 is a small booklet, a notice of intent, containing a selection of Dolly’s art and several manifestos.